The Mountains & the Trees Talk Upcoming Album's "Soft Release"
The Mountains & the Trees just couldn't wait to present fans with their new full-length release, I Made This for You. 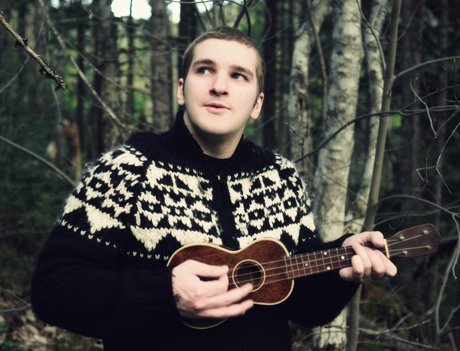 In fact, the St. John's band, headed by singer-songwriter Jon Janes, have been selling their highly anticipated indie folk album at shows, weeks ahead of its August 10 release date. "The album has been done since March and it took all of my willpower to not just release it to the world as soon as the mastered CD-R landed in my mailbox," says Janes in a recent Exclaim! interview. Mindful of distribution and publicity schedules, however, Janes knew he had to hold off on the official release until all the details had been taken care of. "So a compromise of sorts was to take it on the UK and Canadian tours before it was released and sell it from the stage," he explains. Janes says the idea to do a "soft release" of the album was inspired by Toronto's Great Lake Swimmers, who took the same route with 2009's Lost Channels. "I remember feeling kind of special knowing I was holding a copy of an album before it was released, especially since I was able to buy it from the artist themselves," says Janes. "So, part of the reason is to pass on that feeling to others. The other part is because if I had to wait until August 10 to put this CD out, I might explode from anticipation." Although the Mountains & the Trees have released two EPs and an acoustic album since 2006, I Made This for You is the band's first widely released full-length. Janes says that this time around he pulled out all the stops. "I went in with the theory that some artists only ever get one CD before life takes over," he says. "So I wanted to take advantage of the opportunity and do as much as possible — make it sound as exactly like I hear it in my head. Because even when I'm doing solo shows, in my head I'm hearing strings and horns, full arrangements. I really like orchestral instruments in modern music, so there are strings and brass through the record." The soft release was made official at a June 29 show in St. John's — a concert that was recorded by CBC to be aired on the program Canada Live. "The Canada Live show was amazing," says Janes. "It was recorded at the LSPU Hall in downtown St. John's. It's a small black-box style theatre with a beautiful stage." The band filled the stage with instruments — four guitars and amps, drums, including a concert bass drum, bells, melodica, and the suitcase Janes uses as a kick drum. "CBC are great to work with," says Janes, "and had no qualms about any of my requests, like 'Can we mic the suitcase?'" The Canada Live show will air sometime this fall on CBC Radio 2. 2. "More & More & More"
The Mountains & the Trees "Lion's Pride"